Yesterday I wrote about a challenge to the EU-wide snus ban by Swedish Match and the NNA that was being heard in the High Court and my thoughts on why it should succeed. Well, the outcome was indeed successful as the case was given leave to appeal to the European Court of Justice despite being opposed by the Department of Health. 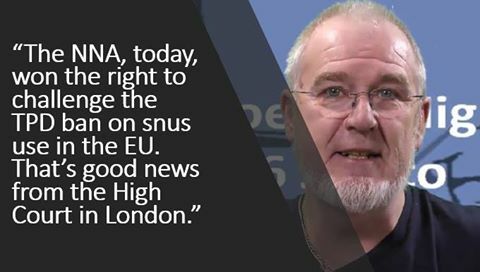 NNA has succeeded in its request to join the challenge against the ban on snus in the UK and the EU. The High Court agreed on 26th January that the challenge can be referred to the European Court of Justice. There were two issues before the court. The Welsh government’s health agency issued a new position statement on vaping this week, which admits that vaping is safer than smoking but repeats earlier demands for a flavour ban. Meanwhile research from the USA adds more proof that age limits on e-cig sales increase teen smoking, while a less positive paper from UCSF tries to resurrect the discredited gateway argument. The Welsh government may have failed to ban e-cigs in public places, but they’re determined that if you do use e-cigarettes to get off tobacco cigarettes, you’re not going to enjoy it. According to Ashley Gould from Public Health Wales (PHW), only children like sweet flavours and vaping companies who sell sweet flavours are deliberately targeting children. Do you want to know if your “quit smoking” advice is sound? Do you believe you’re truly sincere about reducing tobacco use for Americans? Don’t you want to know you’re doing all you can? I certainly do. I’ve devised this quick and easy interactive tool below for anyone in public health or tobacco control to assess the choices (and more) seen above for tobacco harm reduction, and your views. The U.S. Food and Drug Administration’s (FDA’s) “Deeming Regulation” became effective on August 8, 2016, extending the Agency’s regulatory authority over tobacco products beyond traditional cigarettes, smokeless tobacco and roll-your-own tobacco products to include “other” tobacco product categories such as cigars, pipe tobacco, hookah/shisha, electronic vapor and e-liquid products, and components and parts of such products…. A study shows that metal concentrations in e-vapor are one order of magnitude lower than in smoke. This result is highly dependent on the couple e-liquid/hardware tested. Here, nickel is present in the aerosol generated by the e-cigarette. Its origin is the heating element but its toxicity to the organism is dampened because of a quasi absence carbon monoxide. The National Health Department says it’s still willing to regulate e-cigarettes, but will only be doing so once it has assessed how harmful they are to smokers. On Wednesday, during a vapour product association panel discussion, medical doctors and researchers argued that there is no real evidence to prove that vaping is indeed healthier than a normal cigarette. Unsurprisingly there has been yet another study published making a big song and dance about the “gateway” theory, claiming that “teens that use e-cigarettes are three times more likely to smoke” (taken from a headline), or that teens that use e-cigarettes are more likely to smoke. A quick Google news search for e-cigarettes gives you 92 articles, each with a variation of the same headline and all citing the same study, or to be more precise the same press release…. I am a Vaper – one of THREE MILLION in the UK. I have not had a cigarette for four and a half years. I have a YouTube channel that promotes vaping rather than smoking. This channel might be banned under the new legislation. This is my latest VIDEO that talks about the “sword of Damocles” that hangs over our heads from April next year…. My impressions, not necessarily accurate! The presentations were very fast paced, so stuff has been missed. The meeting only lasted 1hr 20mins. There was mention of the slides being made available afterwards. Sarah Jakes (@twigolet) has already tweeted Gerry Stimson’s slides.